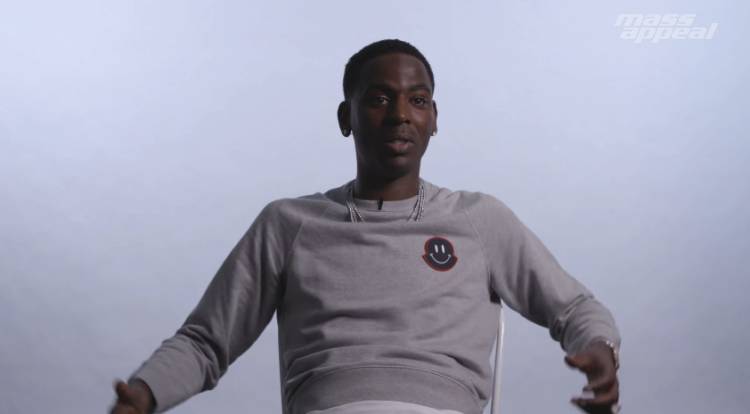 Adolph Thornton Jr., aka Young Dolph, aka "Notorious Dolph" aka "Dolph Obama" has been riding high on the success of his latest album Bulletproof. He also made headlines back in February for surviving a brazen attempt on his life—100 shots were fired at his SUV while on his way to a show in Charlotte, N.C. And he still made it to the stage. Last week the young boss who titled his 2016 album King of Memphis stopped by MASS APPEAL HQ and opened up about his early days on "the wild Hundreds" of Chicago's Southside. "My grandmama in Memphis, she came and took me when I was about two years old and took me to Memphis," Dolph recalls in a remarkable Open Space interview. At the time his mother and father were "in the streets," struggling with drug and alcohol addiction. "I had a problem with my parents when I was younger," Dolph explains. "I just felt like, 'Aw s***, they don't give a f*** about us.' They doin' they thing.They can't do s*** for us. We don't see them." Once he got older and gained more experience he gained an understanding for his parents' situation. "Someone who's just an alcoholic in itself they can't function. That s*** is just all bad." Still he remembers the day his mama told him he was going to be a star. Dolph would go on to fulfill his mother's prediction, establishing his name in the rap game. "I made a song," he says, recalling the birth of his 2008 mixtape, Paper Route Campaign. "Went to the hood. Went to the spots. Went everywhere, like... Pull up on my boys. Lettin' them hear it. They jump out the car. This is you?" He watched the wave build until his debut mixtape became a regional phenomenon: "First it started from, 'We finna show my boys—let me see what it sound like.' To 'Damn, the hood, they love it!' To 'Damn, we got the whole city on this s***!' To 'Damn, we got the whole state!' 'Down there in Mississippi on this s***!' 'Down there in Alabama!' 'Now we in Carolina!' It's like the measles, the s*** spread. And you like... It's a feeling you can't explain." After recounting the high associated with musical success, Dolph also shares his feelings about a near-fatal car crash in 2013—as well as his thoughts on the close call he survived in Charlotte. "It was a crazy situation," Dolph says, calling the recent incident "the biggest test of my life." Asked if he was surprised that the shooting happened, Dolph states: "I was surprised but I wasn't surprised if that make sense." One thing's for sure, he's not tripping. Maybe that's why they call him "the realest in it." "I tell fake from real just offa actions," says a man who's been through some real situations. "F*** everything else. S*** don't make sense I don't want part of it. S*** makes sense, I'm with it all the way." Check out the full interview below.